In 2010, Iraq War veteran Ben Keen was faced with a life-changing decision: Get help, find work, and live the life he wanted—or continue a downward spiral of emotional turmoil and dependency. Today it’s abundantly clear that he made all the right choices, including engaging with a staffing company. 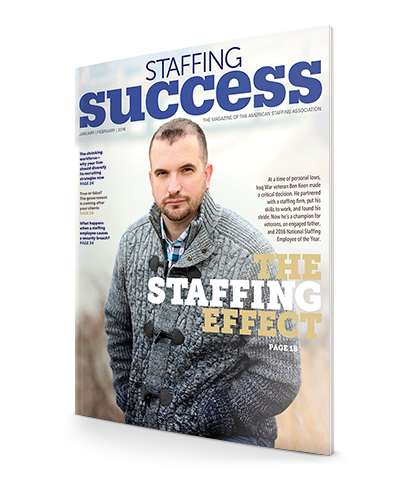 When asked to describe Ben Keen, staffing industry executive Susie Dietrich, SPHR, answers quickly: “Ben is the real deal.” It’s a simple response, but an exceptionally accurate one. Keen is the 2016 National Staffing Employee of the Year—an honor he was thrilled to receive. It is, after all, a well-deserved culmination of hard work, dedication, and making a meaningful difference in the lives of others. bank recently chose to extend Keen’s contract for another six months.